Build links easily in communities related to your niche with the help of this browser extension. Now that I’ve finished my MA, I’ve started to take on more freelancing projects and have found myself conducting lots of link building of late. In doing so, I’ve found this good browser extension that I thought I’d share. A while back I wrote about building links organically by participating in communities that fit around your niche. I gave several examples on how you can find these niche sites easily. One of those examples was a website called “Sites Like“! If you’ve not heard of it yet, allow me to explain. 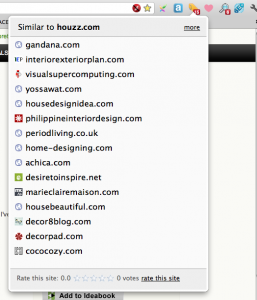 You simply input a URL and it outputs a list of sites it believes are closely related. You can see why that’s a handy tool for link builders? Although visiting the website and inputting your desired URL is already pretty easy, SitesLike.com have got a browser extension too so you can find related communities right from your browser window. I don’t know whether it’s new, or whether I’ve only just noticed it? Either way it’s very handy. So, let’s imagine I’m building links for a website that sells interior design services. In a backlink profile for a competitor, I find an interior design social network site giving out several links. I visit it and then click the ‘Sites Like’ button in my browser. It provides me with 15 examples of similar websites and the opportunity to click the link to visit more in a new tab. I won’t lie and tell you with every single click I find millions of sites that are utopias for link builders: perfect community-driven social networks where you can easily build a number of links, no. But I HAVE found one or two gems that have made it worthwhile. And what about the other non-community sites? They’re still useful too and they be able to give you plenty of link building fuel. They must be related to your niche in some way, since this site relies on tagging by topic. Is the recommended site selling the same sorts of products? Why not run them through a backlink tool? Or are they a resource on your topic? Maybe contact them and ask to exchange links, or better still, request they link to your content. I’ve used this method to build links on several different projects recently with reasonable success. It’s very quick and I have found it to be very useful. I hope it will be for you too, good luck! Siteslikes.com…. I like that site..
It’s really, very handy. I’ve found some great niche websites and communities using it. I thought I’d take a quick look at your site as you’ve been spending time on my site. I need to take SEO a bit more seriously than I do! !